Published: November 2007. Last updated: May 2011. 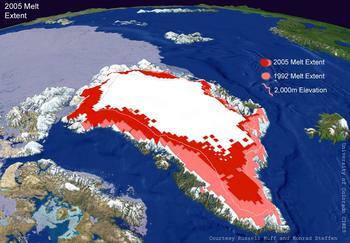 Greenland melt extents in 1992 and in 2002. Image courtesy of Konrad Steffen and Russell Huff, CIRES. In this chapter you will use My World GISTM to explore data that characterize the dynamic Greenland Ice Sheet. Begin by examining photographs, map views, and tabular data. Gain an understanding of how and why scientists are monitoring the ice sheet and what they are finding. Explore map layers that represent ice sheet thickness, weather station locations, and annual melt extents of the ice sheet. View images of the working conditions that Arctic scientists must endure to collect their data, and learn how sensors on satellites are used to gather information from an area as large as Greenland. Gain knowledge about scientists' methods for measuring the glacial ice flowing from Greenland's ice sheet to the coasts, and examine that data to learn how fast the ice is moving.